The first soil and water campaign took place in Crete on 6 and 7 May 2009. Soil samples were collected from three active wastes disposal areas (NF1, NF2 and NF4), one inactive which has not been used for more than five years (NF6) and from a field near an old olive mill (NF3). Control samples were also collected from the wider area. NF1 and NF2 disposal areas contain one evaporation pond while NF4 contains two large ponds. Water samples were collected from wells, springs, streams and rivers. Dr. Maria Doula, Dr. Victor Kavvadias, Dr. Sideris Theocharopoulos and Mr. Athanasios Tsoutsikos. Prof. Vasilis Perdikatsis, Dr. Dimitra Zaharaki, Ms. Chryssa Apostolaki. 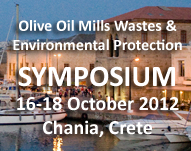 Dr. Apostolos Sarris (IMS) Mrs. Lena Kokkinaki (IMS). The second soil and water sampling campaign took place between 6 and 8 July 2009. Soil and water samples were collected from sites used during the 1st Sampling Campaign but also from more sites of the wider area. Of great importance are the samples that were collected from sites near two streams.